Several government agencies provide unique services and duties to the American public. Some are more involved than others when it comes to regulating asbestos. While the Environmental Protection Agency has limited the amount of asbestos in some products, it does not track its production. The Agency for Toxic Substances and Disease Registry works hand-in-hand with the Center for Disease Control on ways to minimize exposure to the toxic mineral. However, none of these federal agencies prohibit the use of asbestos in consumer products. 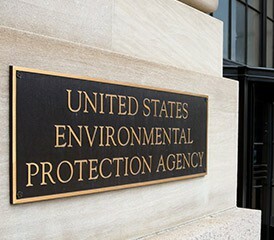 The EPA is empowered to protect human health and the environment. It was the most instrumental of all government agencies in working to ban asbestos. It is up to consumers or buyers to find out if asbestos is present in a product. OSHA’s primary goal is to prevent work-related injuries and illnesses, and it regulates asbestos and asbestos exposure in the work place. Most of the EPA and OSHA regulations are closely related — even overlapped — on purpose. The regulated limit for asbestos exposure on the job is 100,000 fibers per cubic meter for an eight-hour work day. OSHA can pursue violations in criminal court. The MSHA is an agency that regulates safety and health standards in mines. In the United States, mining asbestos is banned. A small amount is imported annually for a limited amount of products. MSHA’s main work with asbestos is to prevent injuries and illnesses at the mine. OSHA and MSHA are agencies of the Department of Labor. NIOSH is mainly focused on being a research agency under the Center for Disease Control (CDC). It gathers information, conducts research and publishes results to prevent work-related injuries and illnesses. NIOSH is not an agency of the Department of Labor. The ATDSR works closely with the Centers for Disease Control to provide solutions that minimize risks of the public being exposed to asbestos. It is strictly an advisory agency and does not make policy nor does it perform any regulatory function. The director of the CDC is also the administrator of ATDSR. CPSC is an independent agency whose objective is to protect the public against “unreasonable risks” from consumer products. The organization is typically headed by three commissioners, all picked by the President, and the commissioners set the group’s policies. The CPSC regulates products for commercial sale and may issue recalls. The role of NIST with asbestos is to provide measurement methods for asbestos limits. It is a non-regulatory agency, and its objective is to promote industrial competitiveness and innovation by U.S. companies through advanced technology, measurements, science and standards. For example, to analyze an asbestos fiber there are two methods, polarized light microscopy and transmission electron microscopy. The purpose of the USGS is to map the location of natural occurring asbestos as well as mines. The group also document domestic production and use, imports for consumption, exports, recycling, tariffs, and government stockpiles. Asbestos is the leading cause for mesothelioma. A closer look at these agencies reveals that not one determines a safe level of asbestos exposure. OSHA goes as far as dictating what is permissible in the workplace. However, permissible and safe are far from the same. What other aspects of asbestos should be regulated by the government?